Ok a summary. 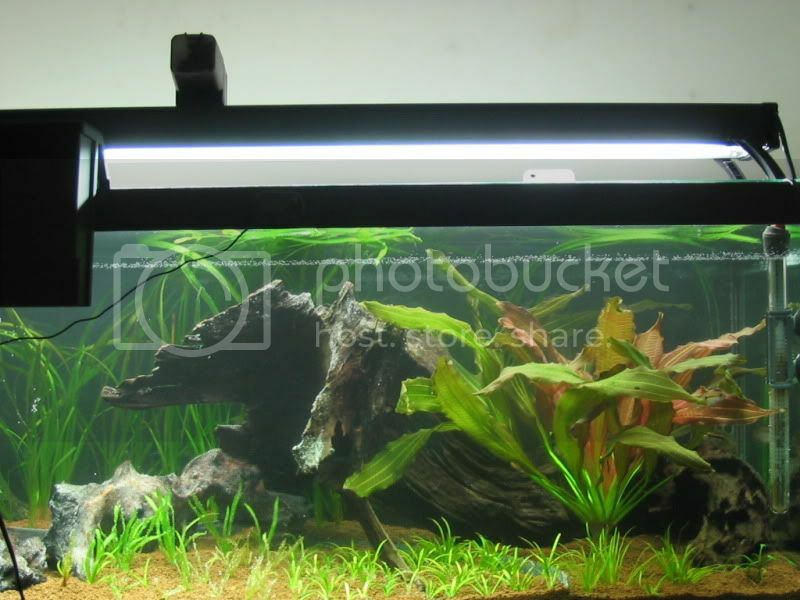 SouthAmeriKazian (my 40g low profile breeder tank) was what I called my stage II tank. I lucked out and got a 75g tank and stand over a year ago, and have been piecing stuff together as I could afford it, to go a little higher tech and give the fish more room. Also wanted to incorporate a couple new tricks. I wanted to keep some main things similar to SA I, such as the layout but more territories, hidey holes and space, the 2 caves that the fish love, simple plant list mix of sa and a few asian, canister filter and more modern light, alot more driftwood, and to break away from flourite. (pressurized co2 still to come). Once I found the main piece of driftwood in the discus tank at menagerie (reserved for me until that tank was taken down 2 months later). The plan of what I wanted the tank to look like happened on it's own. Note this isn't ada amazonia substrate, it's a japanese clone of it called Nisso, and its pretty much the same. Step one was a small initial peat layer under the substrate, b) dryscaping the basic layout, c) using landscape divider to keep certain plants in their specific area. I've went with half moon type shapes for the most part, no straight lines, and the driftwood all tying together to look connected. With the fake cave in the left rear. The plan is once the V spiralis fills in, it will be pretty much hidden from view. This started this weekend, after getting plants from 2 local sources, plus menagerie, then a few hours trimming roots and damaged areas, treating with potassium permanganate, and rinsing, which was quite the chore ! I figured it's a necessary evil. A bonus was the val guy also had e latifolius. With the foreground plants in (from left to right: Pogestemon helferi (downoi), E latifolius, E augustifolius, b japonica, c nevilli. Also added the mopani cave to the rear right. 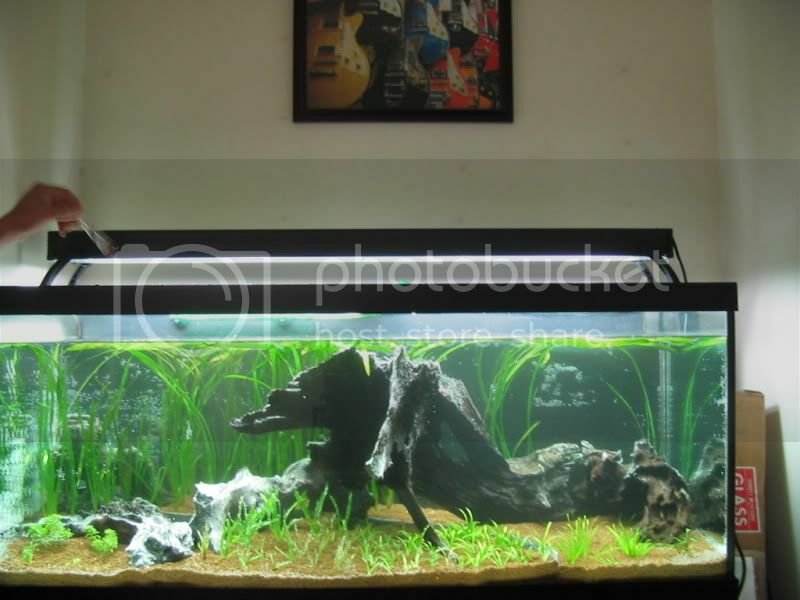 (planned to be an extension of the focal driftwood, while giving the fish hidey spots they were already familiar with. Now to fill in the left rear, behind the main driftwood, and right corner with the addition of approx 30 Vallisnera Spiralis. Most of them over 2 feet long. Where the main driftwood stump and mopani cave meet, needed something to tie it in. I had the E rubin from the 40g tank in mind already. I removed the bad leaves, trimmed the roots, and it was ready to go ! Step 6, the final shot (and sorry for the hob filter and heater from the 40g in front there ruining the look) I was able to move the fish over immediately with no stress. To do: set up the eheim canister filter. remove the hob after a month. Finish getting the co2 components (tank, bubble counter, diffuser). Hide the landscape divider with river rocks. I might get a koralia 2 powerheard for the right side as well. It's so relaxing to watch and my fish are again where I can view them easily. I fell asleep watching them explore the tank last night. Let me know what you think so far ! flow by and watch the tank as it matures. I think the concentration of pp I made to dip the plants was too strong. At the moment most of the e latifolius, downoi and vals went into melt mode, and being in a weakened state the bn's are all over it, damaging things further and uprooting goint on. So right now it's about damage control and patience. Cut off the weak parts of the val stems, replanting whatever the fish knock/pull loose. 2 latifolius left and the downoi is in bits. Going to grab some plastic mesh from the craft store and make protective boxes which hopefully will allow the plants to recover and establish. I love the tank. Especially love the central piece of Driftwood. I had a similar idea for my 75G a couple years back, but abandoned it because I was never able to find the perfect piece of wood. Anyways do provide us with an update soon. How are the angels doing? Wow. Sorry to hear your plants are going into melt mode. Love the look of the tank in the pictures. 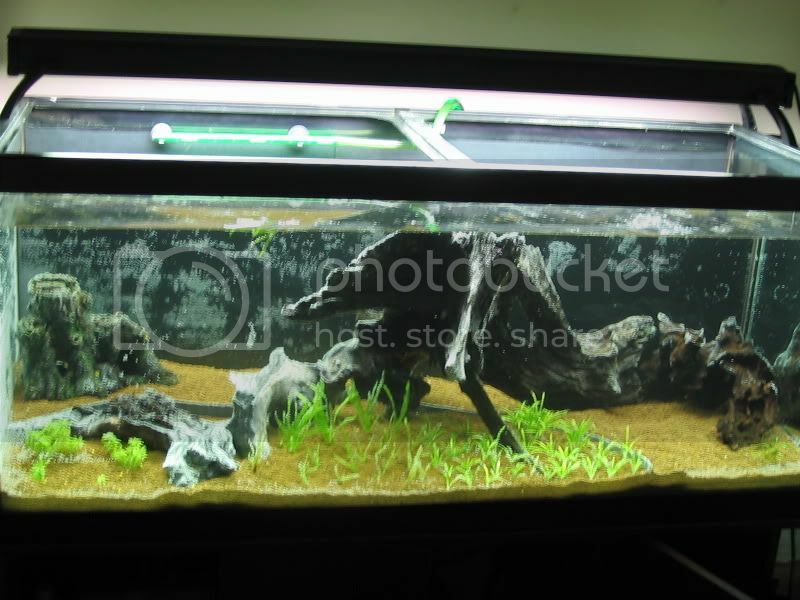 Maybe some Anubias plants would look great attached along the driftwood. Would have loved to have seen the tank when the plants have filled out more. But hopefully they can be salvaged and we'll get to still see this. A quick morning update, I'm not awake yet ! The angels have adapted well to the tank, and have apawned twice. The person I got the vals and e latifolius from kindly offered me more ! Another 2 hour round trip, pulled most of the vals from the back and replaced with fresh ones, no chemical dip this time, also plenty of e lat left over to seed the 40g tank. I'm liking it much more then the e angustifolius. Totally hit a stroke of luck, my fave store got in some zebra otos, and for a steal of a price. I grabbed 8, lost one, the rest are doing ok ! Found some veggie clips at the dollar store on the weekend so I can supplement cucumber, zucchini etc. The red color is gone from the sword, have to figure that out. The nutrents are there. Maybe since from a higher light tank to a lower ? The person I got the last batch of plants from, I gave my bn plecos in trade, so the current plants aren't being damaged. I'm glad they're in a good home and that freed up room for the otos. Awaiting a friend to come over with a higher megapixel and 15 opt zoom camera to get some better then usual shots. Sounds good mate! Can't wait to see pictures! Red coloured plants often show their best colours under higher light levels. So its reasonable to say that its losing its intense red colouration is due to the lower light levels in the new tank. DaMossMan... sick tank! I love your "simple and clean" approach. I'm definitely going to bug you on ideas for my new tank in the coming months. Brilliant ideas, using the landscape divider, using the vals to hide the fake caves. Very cool. Gomer, I suspect you are right ! The 40g was 96w t5 + 30w NO, over a tank 14 inch high so 3. something watts. Now 110w t5 HO over 75g. Alot more tank height. However, the light penetration down to the substrate level is very good. I was advised with the high output the usual wpg does not apply and that it would be sufficient. Maybe I should pull the glass top out. The sword was stressed when it was moved tho and is still recovering. Some fert tabs may help as well ? The stock lights were 5000 or 5500k plus a roseatte. I've replaced the roseatte with a 6700k. I grabbed 2 more 6700k on sale this weekend, so I'll also replace the 5000k. Hoping that will help too. Thanks Pheonix - the landscape divider idea came from a long time plant mentor to keep vals and e tenellus in check. It's not easy finding the right driftwood, I lucked out ! I had bad plant collectoritis before, so needed to chop down my plant list. I gave up leafy stem plants sometime ago, too much maintenance. Not sure when the good camera will be here. 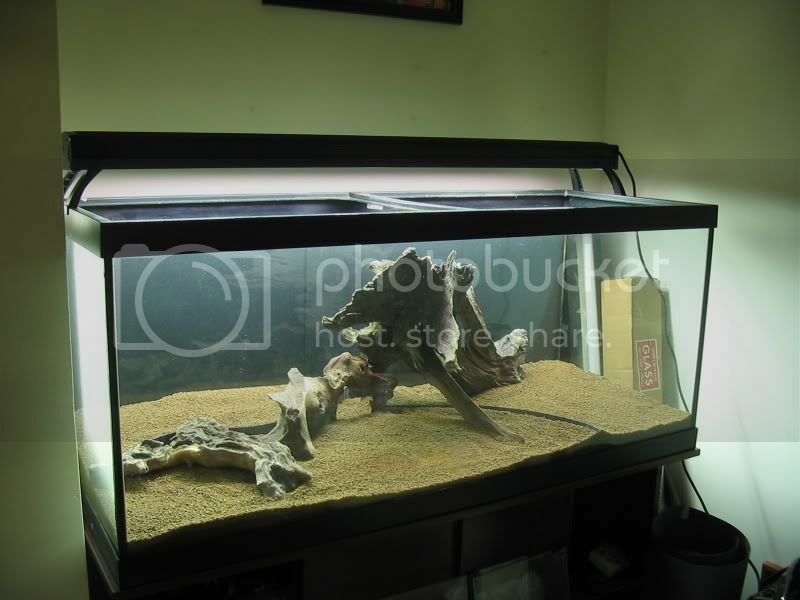 The tank looks pretty much the same except no red in the sword but want to get some angelfish and zebra oto shots to share. Well the wood looks really nice. So hard to find a piece that fits and works with what you want to do. I lucked out a couple weeks ago finding some (picks in a couple threads down) and now I can't wait to get mine started. Can't wait to see the pics of your zebra ottos too. I saw your driftwood, very nice ! I tried taking a couple shots of the otos last night, too fuzzy on closeups. I'll have to try and adjust the camera settings again. I'd love a new camera. Nitrates are 20 or a bit higher, I'd like to try and maintain it at 10 if possible ? (would be a first) so saturday was maintenance time. I read over 10ppm you are feeding algae. I want to get into better maintenance habits. Replanted 4 vals, brushed the driftwood, cleaned the inside of front glass & a bit on the side, then changed approx half the water. I'm so grateful I now have a python. Dosed excel, potassium, and double blackwater. This batch of vals and e latifolius have not been flattened, snapped, knocked loose, chewed, and the prior batch is recovering. This tells me it was a good move to rehome the adult bn's. I'm impressed with the eheim canisters water movement and like that it runs quiet. 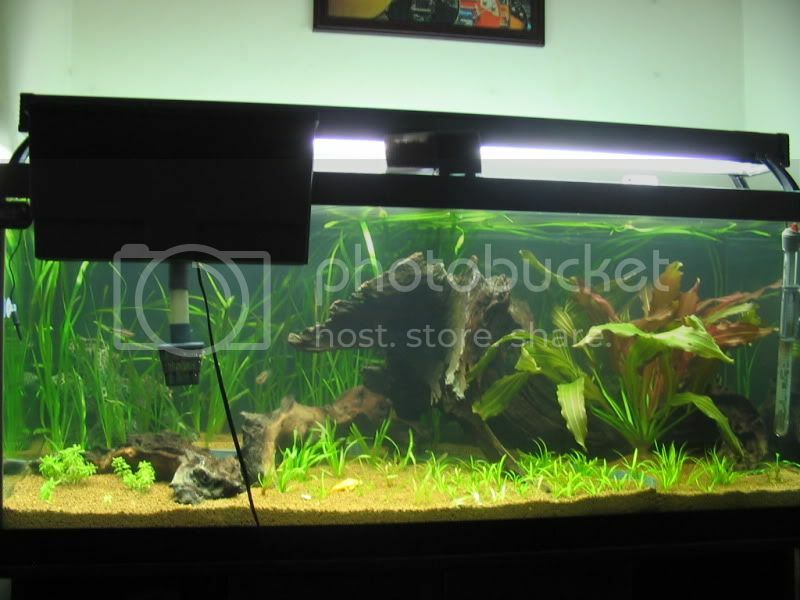 I will need to learn when/how to service the media, and what media is good for a plant tank. What sort of eheim canister have you got? I've got a little eheim classic 2211 and has only been running for 1 month. What media are you running? From what I've read you can tell when you need to do maintenance by keeping an eye on the water movement. When you visibly see a drop in the filter's output you crack it open and clean the media. I've read people only having to clean their classic canister once every year. But I doubt they have a heavily planted and well stocked tank. So for my tank I'm guessing every 2 or 3 months I'll have to rinse out the filter media. Standard media is what I've always run, minus the carbon since I've read it catches some of the nutrients the plants need (don't know of any hard fast scientific research done on it though). Depending on how much leaf litter you get you might want to do a pre filter over the intake that you can clean easily every day or two. We don't clean our canisters as regularly as maybe we should, granted we've moved more than once a year since we've had them set up so they do get their clean outs . I'd agree with the every 2-3 months. Its a classic 2217, standard media as far as I know. I bought it used approx a year old. All I did when I got it is leak test, let the water run till it was clear. Good flow from the spraybar atm. I have to point it down during the water change or it'll squirt me right in the eye lol. Not really any leafy plants to gunk it up atm. Vals, grassy plants and the sword, but if that extends clean time for the filter media, I'm all for it. It did help with the hobs when I made a prefilter from media sponge. Thanks for your tips and input, it's very appreciated ! I have a new commitment to keep water quality up, doing the w/c soon as the nitrates hit 10. It was at 10 after last saturdays w/c. My liquid nitrate test kit ran out, I'm going back to test strips for a bit to save time and fuss. You can also cut those down the middle to get twice the tests. I traded someone an 80g ide hard-drive for windows7 pro. I wanna see pics! 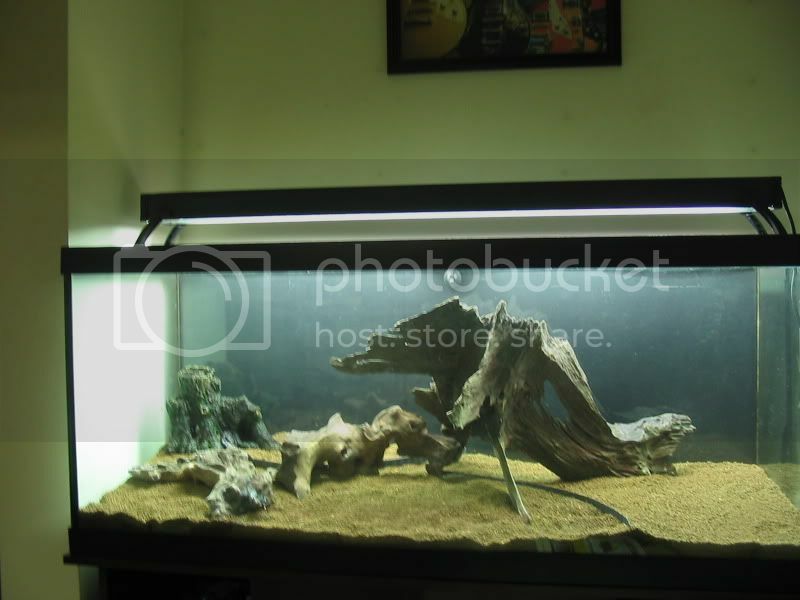 I'll be posting pictures of my new tank this afternoon in my thread in the plants forum. Now update Pics Mr Mossy. Your tank is a beaut by the way, and to think you made the tank yourself, you should be very proud of your work & scaping skills. I'm awaiting the camera still, have a cold atm plus a loss in the family today. Will try to do pics soon as I can. The nitrate strips weren't avail at store 1, just a 5-in one, which was inaccurate, and not specific enough for me 0, 20, 40 nitrates etc. The nitrate strips at a diff store also not specific enough so I bought a liquid test kit again. Test tomorrow, if not tonight. Da sorry about the loss in the family. Looking forward to seeing those pics too, but no rush!